If you still like sketching and writing by hand, but also want quick digital backups of your notes, you'll find a friend in Wacom's new Bamboo Spark. Japanese company Wacom, known for its stylish and popular drawing tablets and input devices for graphics professionals, recently released the fashionable Bamboo Spark ($160). It’s an interesting hybrid of paper and digital, and it offers the best of both worlds—though it also has some limitations. Bamboo Spark is a handsome, Japanese-minimalist-style, charcoal gray folio (8.1 inches by 10 inches by 1.2 inches) that fits well in corporate conference rooms. Inside, you find a paper notepad for drawing or writing with the supplied Bamboo pen. You can use the pad that comes with the device or many other notepads that measure 5 inches by 8 inches. Unlike a traditional paper notepad and folio combo, Bamboo Spark has two buttons on its “smart” folio: a power switch and a Bluetooth connectivity button. The folio features an embedded Electro-Magnetic Resonance (EMR) board, which communicates with and powers the pen. (The pen doesn’t have a battery.) The EMR board senses and stores pen strokes, up to 100 pages, even when it’s in offline mode. The folio also has a Bluetooth radio that can beam stored pages to the Bamboo Spark Android and iOS apps. And the Bamboo Spark’s battery is good for about 8 hours of use, according to Wacom. Though the device works with many standard 5 by 8 notepads, the Bamboo pen requires special Wacom ink cartridges. The pen comes with a cartridge installed, and you get two extras in the box. Three-packs of replacement cartridges cost $10. After you transfer drawings to Wacom’s cloud and the Bamboo Spark app, you can further annotate them. (You get 5GB of free Wacom cloud storage.) You cannot use the Bamboo pen for this task, however, because it’s an actual ink pen, not a stylus. Other styli work, but then you have carry around more components. 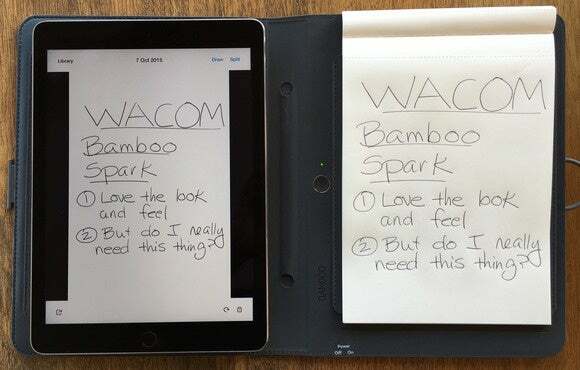 Neither the Bamboo Spark apps nor the Wacom cloud use optical character recognition, so your handwritten pages aren’t automatically editable or searchable. As a workaround, you can export files as PDFs in the Bamboo Spark app, and then import them into Evernote, OneNote, and other apps, where they can be edited and searched. I used the Bamboo Spark-to-PDF-to-Evernote import method, but the text in the PDF wasn’t searchable in Evernote. However, I had better luck using Evernote’s free Scannable iOS app to capture the same page, and then the text was instantly searchable in Evernote. Is Bamboo Spark right for you? By now, you may be wondering: Who really needs a Bamboo Spark? If you still work most efficiently via pen and paper, but you also want digital copies of your notes for future reference, Bamboo Spark might be for you. But beware, at $160 Bamboo Spark is pricey for what is basically a fancy notepad and folio, and it weighs about 1.4 lbs. (according to my postal scale), more than many tablets, including the iPad Air 2. You also have alternatives. Livescribe’s line of smartpens ($120 to $230) require special paper, but they can do cool things such as record audio. And you can always go with plain paper, regular pens, and free (or at least inexpensive) scanning apps. 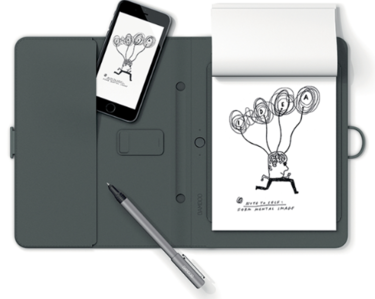 This story, "Wacom's Bamboo Spark elegantly digitizes handwritten notes, drawings" was originally published by CIO.